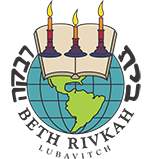 Beth Rivkah's modern, spacious new Brooklyn campus, built to memorialize the life of Rebbetzin Chaya Mushka Schneerson, obm, dear and devoted wife of the Rebbe, , was designed to accommodate our ever-growing student body. The groundbreaking ceremony occurred just thirty days after the Rebbetzin's passing, a ceremony in which the Rebbe participated personally, in an unprecedented way. He briefly appeared on his way to visit the final resting place of the Rebbetzin, presenting Rabbi Abraham Shemtov with a contribution in the amount of $470—the numerical equivalent of the Rebbetzin’s name. The Rebbe asked that the primary benefactor of the project, Mr. Ronald O. Perelman, be informed that he wished to be a partner in building the campus. Interestingly, the campus’ street address is also 470. The 125,000 square foot campus is ideal for learning and acquiring life-experience, a place where over 2,200 students utilize nearly 100 classrooms as well as science labs, computer centers, libraries, a vast rooftop playground, and a huge sports gymnasium every single day. Today, the name Campus Chomesh represents more than a magnificent edifice. It embodies the heart and soul of a worldwide movement in education for women and an investment in the future of the Jewish nation.